the punjabi (hindu) wedding ceremonies can be performed either in the arya samaj or the sanatan dharm way. i have no idea which one is going to be followed in my wedding but i shall soon find out. see the list of ceremonies that are performed according to arya samaj here and according to sanatan dharam here. oh did i mention that my boyfriend is an Agarwal (agarwalla actually) which means we belong to different castes. I am a Kshatriya where as he is a Vaishya and so when we get married we'll have to take care of the rituals and ceremonies for both the castes. i am aware of the hindu caste system and accept it as a part of our history but i, in principle do not practice or promote it in any way and wouldn't like to do so, although i find the theory of ancient categorisation into 4 varnas truly fascinating! you may read more about it here. i am also a Proud Punjabi (PP) maybe even a FPP(fiercely proud punjabi). 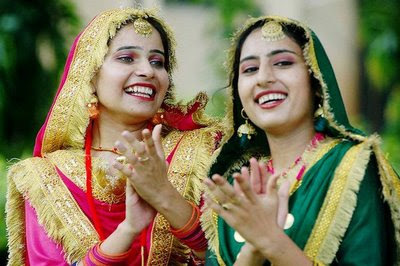 i think punjabis the world over rock and know how to enjoy their lives to the fullest. i typed in a few words and i found more reason to think and believe like i do already:)!! 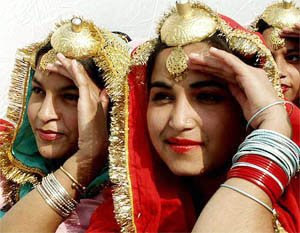 more on the punjabi wedding customs and rituals here. these images above are from an old blog entry from my other blog AND ANOTHER where i talk about textiles, my love for all things indian, home interiors and design inspirations. very interesting hope all the wedding plans go well I love all the Indian clothes & colours they are so exotic! Its gud to see that u know actually what you want coz most of the people are very confused.. ritu kumar & sabsyasachi are both my fav! One of my college frend recently got married and wore a sabsyasachi lehenga... she looked amazing!! may be i can try n send u her pic... And the trinity ring cant believe we have such similar tastes.. even wanted one unfortunately cudnt find it so settled for similar looking :) Please opt for real jewellery with the lehenga... if you plan for your jewellery to be custom made i can tell u a designer.. u can show her the designs u want and she replicates and even giver her inputs..she is really gud worth a visit!! Hello there! you didn't write your name!! Thanks for your wishes and the comment! do keep visiting i'll be posting more regularly here! hey neha...yes i want to wear only real jewellery for the wedding in any case i am allergic to most metals and finishes except gold an dsilver:) please do give me the contact of the designer that'll be a great help, does she have a website? i don't think i'll be able to afford a ritu kumar or sabyasachi myself...but i wish to get the look that the two designers manage to pull off..and pls do keep commenting...i'll need all the help, thanks!